purifier, capable of glomming onto pollutants and even thriving on them. Pond slime is made of biofilms—colonies of microbes, often a mix of one-celled algae and bacteria, whose cells are glued together by their secretions. The glue is EPS, which stands for both extracellular polymeric substance and exopolysaccharide. Sewage-treatment engineers and pollution researchers already know that algae, like certain larger plants, can neutralize a variety of impurities in water. But the exact role of EPS in algal biofilms is less well studied—unless you’re biology major Katie Scheu ’07 and her algaphile professor, David Domozych. When Scheu wanted to learn how to use Skidmore’s scanning electron microscope, Domozych suggested a research project on EPS. Along with sticking the biofilm onto stones or other solids, EPS may supply nutrients for the member microbes, and its expansion can even help them move by gliding along with it. Domozych is currently studying how cells produce EPS and how it forms and maintains biofilms in the acidic environment of bogs. a dose of nitrates, or phosphates, or both, or no added nutrients. After a day or two Scheu checks for population changes in each microcosm. In the Mahoney Electron Microscopy Lab, she can clearly see and count individual organisms; in fact, she can actually see strands of EPS material. 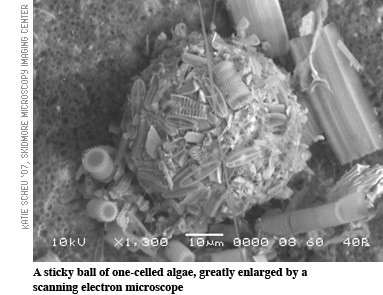 (Once, she even saw a clump of diatoms that was rolled into an improbably perfect little ball by microcurrents in the pond.) Alternatively she uses the Lintilhac Microscopy Lab to gauge numbers of different algae by the way their pigment molecules glow under a confocal fluorescence laser scope. General results so far suggest that blue-green algae and diatoms multiply when nitrates alone are added, but desmids thrive better with both nutrients.